Tell somebody to tell somebody that knows somebody that's a bead lover and would love to train and be better starting from 2016. Well I am one of those people who will rebrand beadmaking in Nigeria, Africa and the world. So I am inviting as many as are interested to come and join thr moving train of African creativity as we start the new year. 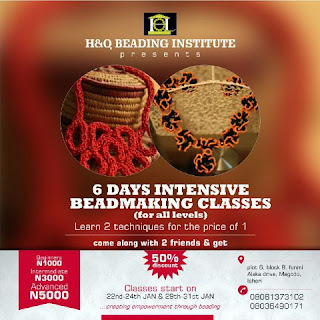 Start your beadmaking journey for as low as 1000naira. More details in the attached image. Radar* I meant not rather...lol.